Limb sport of Starking, 1954, Wayne Harrold, Zillah, Washington, USA. Striped red overall,otherwise similar to ordinary Delicious; maybe a day or so earlier. (Shown at right) Whole tree sport of Starking, 1945, George W. Neff, Pateros, Washington,USA. Striped red overall, otherwise similar to ordinary Delicious. Patented by ANFIC. Van Well variety, USA. An early and heavy cropper. Large, very‘typey’ shape, very early colouring with high colour and pronounced stripe,creamy white flesh without yellow tinge, juicy, firm, crisp, matures a little later thanlateral bearers. Patented by Flemings. Limb sport of Red King, 1964, Wayne Trumbull, Milton-Freewater,Oregon, USA. It can runt out if overcropped, slightly more vigorous than Red Chief,precocious, attractive early colour, starchy at harvest but flavour improves after shortcoldstore; susceptible to mouldy core. Patented by Flemings. Limb sport of Starkrimson, 1966, Fred Campbell, Othello, Washington,USA. 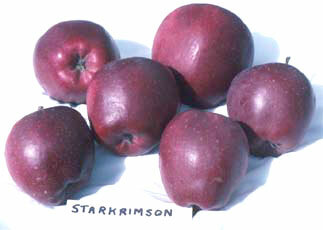 Less vigour than Starkrimson or Oregon Spur, precocious, solid red overall with slight stripe, attractive, not as dark as Starkrimson; can sometimes get russet; matures abit later than laterals, but before Starkrimson. (Shown at right) Whole tree sport of Starking, 1953, R. A. Bisbee, Hood River, Oregon, USA.Usually long and ‘typey’ shape. 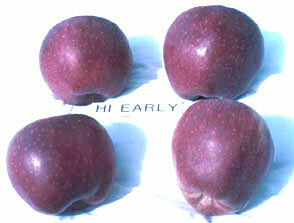 Solid crimson overall, can be almost black,especially with young trees. May have a slight stripe. One of the most susceptible Delicious strains to russet in some seasons. Greenish white flesh. Matures later than most lateral bearers. Chance seedling, J. Hiatt, Peru, Iowa, USA, about 1880. Susceptible to scab and woolly aphid, some resistance to powdery mildew. High, more than Granny Smith. Granny Smith, Jonathan, Bonza. All red strains flower at about the same time but will not cross-pollinate each other. Medium, tall conical with five crowns. Striped red on 25–50% of surface. Heavy yield; can be biennial if overcropped or after no crop. Long storage, over 12 months in controlled atmosphere (CA), as for the red and spur strains.